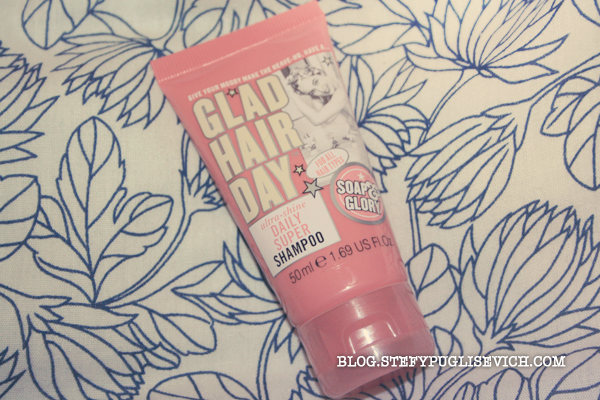 Soap and Glory have been a brand i had yet to try. I popped into Boots and saw the mini travel sized products for £2.50 each and with an offer of 3 for 2 so basically i'd get 3 for £5 which is pretty good for travel sized miniatures. I am very picky when it comes to hair care. I do not swap my Aussie Shampoo and conditioner for anything but since i left mine at home in Malta i said why not try something new. Give your moody mane the heave-ho. Have a .... GLAD HAIR DAY (for all hair types) It is the ultra shine Daily Super SHAMPOO. The fruity fragrance was indeed a mega plus as it did leave my hair smelling sweet and lush. It's 30ml so if you use the right amount you could get at least 4-7 washes out of a travel sized. Pairing this with the GLAD HAIR DAY CONDITIONER my hair did feel ever so soft and silky. I would truly recommend to anyone wanting to try a new product. HAVE YOU TRIED SOAP & GLORY? I can't find it in Malta either, so glad they are widely available in the UK!